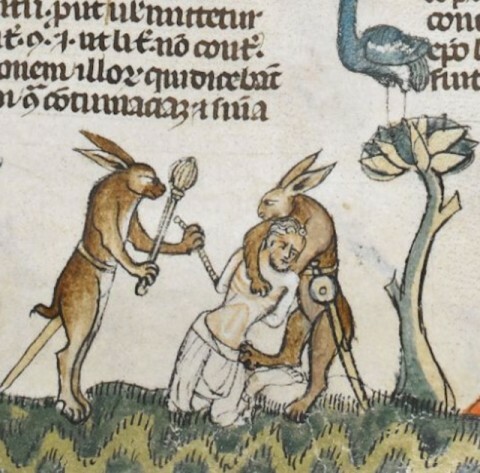 BTW: there are a bunch more medieval psychoses on display at Tom Kane’s site, who, it seems, has come up with a socially useful application of writer’s procrastination syndrome. My awareness of all this comes via @PZMyers, who got it from @SirWilliamD. And with the honors thus done, you may consider this a “how weird will your holiday get” post. Add your own notions in the comments. 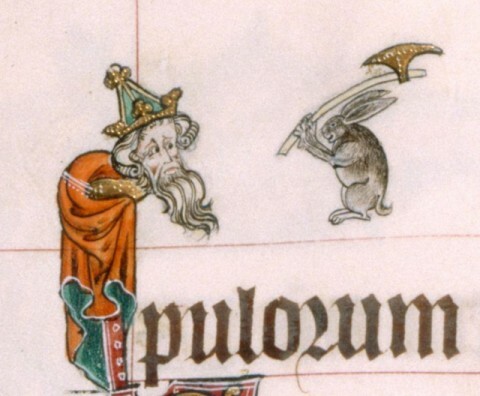 Images: Axe-rabbit comes from the Gorleston Psalter, England, 14th century. This entry was posted on November 26, 2013 at 5:22 pm and is filed under Brain bubbles, The Way We Live Now, The Way We Lived Then. You can subscribe via RSS 2.0 feed to this post's comments.